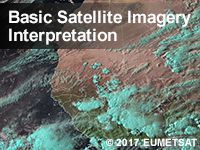 This lesson teaches the basics of satellite image interpretation to forecasters, meteorology students, and other interested learners, with an emphasis on the African region. It begins by briefly describing visible, infrared, and water vapour channels, as well as RGBs and derived products. From there, it teaches learners how to interpret clouds and surface features using various channels and products. This sets the stage for the final section, where learners practice identifying features using assorted imagery and products. The lesson uses Meteosat Second Generation imagery over Africa and, to a lesser extent, Europe. Given the similarities in channels between satellites, the lesson should also appeal to a broader, international audience. This lesson is being designed to support EUMETSAT training courses, such as the online Satellite Application Courses run by EUMETSAT and the African training centers. It was a nice lesson. The lesson was enjoyable and well understood. If you are new to this, take notes on the products and what the colors mean because it is confusing sometimes. Patient learning is necessary with this kind of study! The lesson was an eye opener,it actually increase my level of understanding on the use and interpreting satellite imagery.The intervention of the trainer throughout the lesson could have made a great impact. It was indeed a wonderful experience,i learnt a lot,and i am ready to shear the knowledge gained. Satellite imagery is in deed a good tool for quick weather review over a larger region. This quiz is absolutely informative and is good for junior meteorologist. As for me I still need more lessons on the water vapour channels. An amazing test, i advice everyone to pass it. Rose from a dismal 44% on pre-quiz up to 91% on the final quiz. I would say this indicates the module instruction level/value is good. the course was useful for me. The lesson is quite interactive and that makes it easy to understand especially with the exercises. the experience is very good and I'm learning a lot, since it's a new meteria. The lesson is very interesting. It's an essential step for beginning with Satellite Imagery Interpretation. Highly recommended.Thank you. The lesson Basic Satellite had been so exciting and helpful. This lesson is interested.I would estimate the rate of lesson around 70%. This lesson was a challenge to me as far as cloud thickness identification is concerned.It really pushed me to study more on land and ocean identification of WV imagery. I am very glad to have this course becuase i am actually working at Bujumbura International Airport as weather forecaster, thank you. This lesson was very interesting for the knowledge of the usefulness of each meteosat satellite image channel. Great experience and one learns a lot of things about satellite imagery products and their uses which i find applicable in my line of duty as a forecaster in meteorology. Many thanks to MetEd team. Like others who scored low, some questions appeared not to have specific answers if you compared from the net and that of the text. Night microphysics RGB from technical notes indicates blue and brown colours .This combination was not given in the alternatives in the last question.There were several questions with this kind of arrangement ! Perhaps it is why I scored low! C'est une bonne source pour initier les connaissances de base et approfondissement sur les images satellitaires. There were challenges attempting these questions. I found the lesson quite effective in the online course, especially by the animation and the comprehension question as one progresses through the Course. These technique help a learner grasp the lesson well. I would recommend adding answers and explanations to the pre-assessment and quiz questions. I really enjoyed this lesson which provided me with useful elements for the basic understanding of satellite imagery. The lesson helpful to me. This lesson very good, everything was fine and useful. I found more information and skills in Satellite Imagery Interpretation. Thank you. this course was very wonderfull and help meteorologist technician to improve theirs knowledge. The training course is very informative and interesting. Useful for obtaining information from various satellite channels for weather forecasting on a short time. With help to use of satellite applications and products, i have better understand of the development of nonlocal weather characteristics in cold air mass. By participating in this course can improve your skills in detecting and monitoring non-local meteorological characteristics in cold air. This lesson presented a wealth of information at a "beginner-friendly" level. The lesson includes lots of great practice exercises. I found the quizzes quite challenging! As the new GOES 16"R" and GOES 17 "S" become the norm in weather satellite technology, this lesson is absolutely necessary to understand how to interpret the changes that are coming. it is good for all forecaster on the field. Really nice to be able to compare imagery. Some of the interpretation/usefulness could have been better laid out, but other than that a good lesson. This lesson is usefull for beginners but also as a repetition for more experienced weather forecasters. Interesting solution by comparison two products on one image. The topics are well formulated with practical examples. It has helped me to understand the RGB satellite product, which I did not know about. Thank to the all team! As African countries are frequently in the questions, program in an overlay map for each image. One that can be turned on and off using a radio button. Takes time to reference an outside map to id all the countries referenced. Thank you for making this available! Excelente curso, para afianzar los conocimientos y aprender otras bondades de las imágenes de satélite. Interesting course and useful for people with an interest in weather forecasting, I learned a lot and will have to revisit course contents to update my understanding.Thank you for creating an intrest. Good course. Definitely take your time on the comparisons of different products to appreciate the strengths and weaknesses of each. This was my first exposure to satellite imagery. As such I learned a lot. I'll probably re-take the class as I gain more experience. This lesson helps me in my studies. It hepls to buildmy future by understanding that. I even learned that Lesotho could be a snowy country! There were sufficient drills in the module to reinforce learning. Comparison and contrast were given good emphasis throughout the module, which helped a lot in remembering concepts.